People who have known both Keith and me for some time are most likely aware of our fondness for classic Doctor Who. In fact, it was our common love for the series that served as a foundation for our relationship, so it’s no great surprise that when Fathom Events decided to air this classic episode from the shows 12th season on the big screen that we would both go with great excitement to revisit one of our personal favorite stories. The Doctor, a renegade traveler from his home planet of Gallifrey, is a Time Lord. They are the self-appointed guardians of space and time, and while they seldom choose to act or interfere in the affairs of others, they would have no qualms with drafting The Doctor (his real name has never been revealed) into doing their dirty work. Now the Daleks are a malevolent race of aliens that inhabit travel machines. The Doctor first encountered them in the far future on their home planet of Skaro, and while he, with the help of the peace loving Thals as well as the Doctor’s own traveling companions, managed to defeat the Daleks, they were a race of beings the Doctor would encounter again and again throughout time. 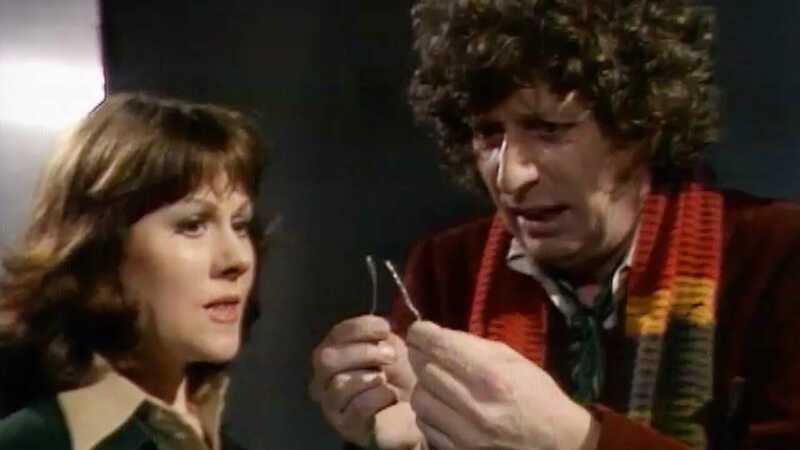 It is here that the Doctor, while trying to transport up from Earth to a space station along with his current traveling companions (Harry Sullivan played by Ian Marter, and Sarah Jane Smith played by Elisabeth Sladen) suddenly finds himself in an unfamiliar setting, only to be greeted by a fellow Time Lord who is there to task the Doctor with a mission. He is to go back in time to when the Daleks were first created, and either avert their creation or alter it so that they would evolve into a less menacing race. The Doctor reluctantly agrees, and along with Harry and Sarah, they make their way over to a military bunker set against a backdrop of a 1000-year war. The Doctor learns that the two groups of people on the planet, the Thals and the Kaleds, have been warring for 1000 years, and the Kaleds’ chief scientist, Davros, has introduced a travel machine for which the Kaled people, who are mutating because of the chemical weapons used in this war, will be able to inhabit and use, and that travel machine is the Dalek! The Doctor, after having been captured, must try to find a way to escape and bring about the destruction of this race by destroying the incubator where the new mutations are growing. A series of missteps take place that sees Sarah separated from the Doctor and Harry, and forced to work for the Thals in the completion of a rocket that they hope will end the war. Meanwhile the Doctor has convinced some of the Kaled scientists that this development of the Dalek is purely evil and they must try to do their part to stop it. When it becomes clear that Davros is far too sneaky to be stopped, the Doctor tries once more to end the Dalek development on his own. This presentation was a stripped down director’s cut that had only been shown once before on the BBC as part of a Christmas Program, combining all 6 episodes and then trimming it down to roughly 90 minutes. The result was unfortunately rather jarring. Keith and I have both seen this episode countless times and have many of the scenes memorized. But even without having them memorized, what ended up as part of the regular television broadcast for the series had a very smooth feel to it, as one scene would flow into another. With this the cuts were at best abrupt, and at worst somewhat confusing to any first time viewer. Still, watching it now allowed for some details to come into focus that had possibly been missed. On the positive side there were many of the nuances that later Doctor Who showrunners would use as a springboard for a storyline involving a great and terrible Time War, and it has been alluded to the fact that the Time Lords “shot the first salvo” by sending the Doctor to avert the Dalek creation. Later, there is a scene where the Doctor is facing a terrible moral dilemma. Does he go through with his mission and destroy the Daleks, basically committing genocide, and in doing so become as bad as the Daleks themselves? That is a thread that would be revisited only a few years ago during the first series of episodes with the outgoing actor Peter Capaldi as the Doctor, and an episode where he actually is forced to help a sick Dalek, and in doing so is referred to as a “good Dalek” by his patient. Going back to this episode, the Doctor poses the question about possibly killing a child if he knew that child would grow up to be utterly evil. That would happen again in a Peter Capaldi episode where in the slightly earlier years of the war on Skaro, he finds himself rescuing a child from a minefield, only to learn that the child was Davros. It’s these little Easter Eggs that would feature later in the series that gave this particular story more meat to chew on. Then there are the downsides. In addition to the poor editing to make this 6-part episode one continuous story, the visuals used here are laughingly bad. It’s common knowledge that the BBC budgets for television were pathetic, so when it came to watching it on the smaller television screen it was easy for fans to just give it a hand wave and basically move on. Not so with watching it on the big screen. The sets were beyond flimsy, and watching the Daleks move, as well as Davros, was hilariously funny, as they would waddle while supposedly rolling along the floor. Even the Dalek costumes themselves looked like they were worse for the weather with bad moldings for parts, peeling paint, etc. 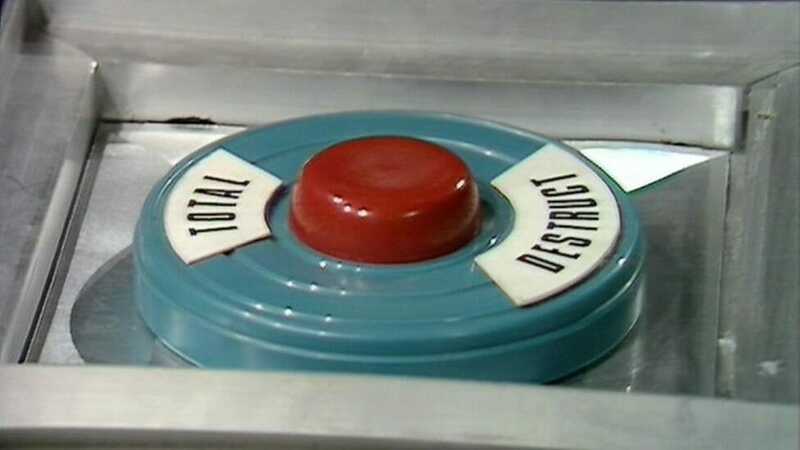 However, the greatest gag came towards the end when Davros, in an attempt to stall the forces trying to stop his Dalek development, shows them a button that would destroy the incubator containing all of the Kaled mutants. What we saw was a BIG RED BUTTON and around were the words TOTAL DESTRUCT. To see it sitting out there on a console like that generated lots of laughter from the audience, which I’m sure was not the intention of the BBC television division at the time. Writer/creator of the Daleks, and this story, Terry Nation, has admitted that there have been correlations to the Nazi regime. Even going as far back as the serial story “The Dalek Invasion Of Earth,” which was broadcast in 1964, saw London be invaded by the Daleks. 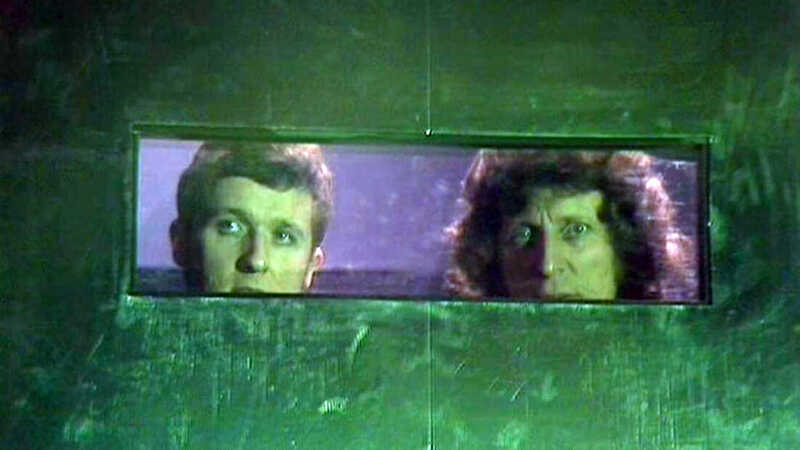 That story was deliberately creepy as this episode aired less than 25 years since the London Blitz of World War II, so many older adults who watched this episode would have to contend with the memory of that terrible time. So it’s no wonder that the Daleks were to have a Nazi feel to them, but then you add their creator, Davros, and you have the sci-fi version of Hitler. Here is a scientist who introduces aggression into his Daleks and desires for them to be the ultimate terror of the universe, thereby immortalizing himself through his creation. They are also programmed to seek out non-conformities, which has just too much of a familiar feel to a much darker time in our world’s history. Seeing this aspect of the story has always made me feel uncomfortable, as Davros is an absolute megalomaniac, yet his character’s motivations aren’t entirely alien. His methods may be entertaining, but his reasoning is not, which serves as a reminder for some of the better things that good science fiction can do. Despite the poor production standards, and even the haphazard editing of this story, the essence of what was being communicated remained. 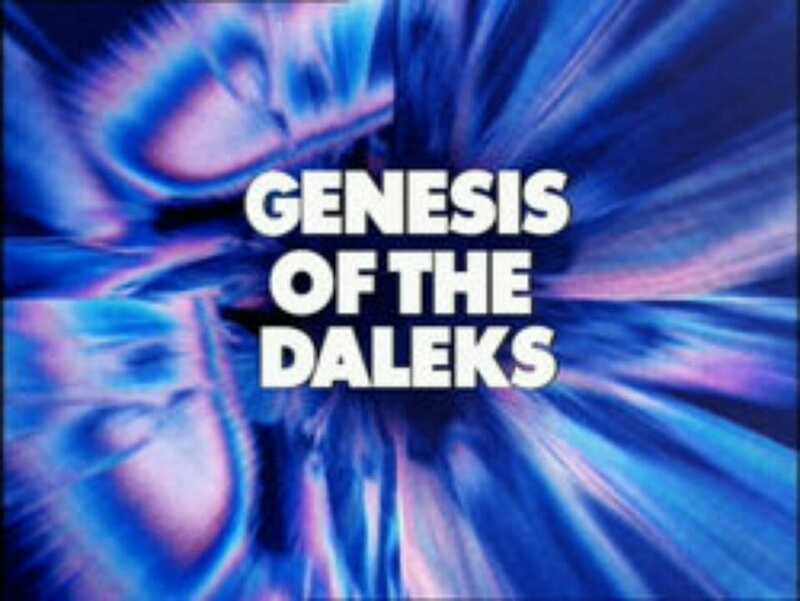 “Genesis Of The Daleks” serves as one of those morality plays about how dangerous it can be for people like Davros to rise to power, so from that particular perspective, Doctor Who: Genesis Of The Daleks was still a triumph to watch, but if you want to really appreciate the story as it was intended by its writer, you would be better served watching the original 6 part episode as it originally aired back in March of 1975. Previous K.D. Edwards’ “The Last Sun” is Pure Magic!